While libraries and makerspaces are both interdisciplinary, resource-filled places of informal learning, each serves distinct purposes for enriching student experience and school culture. More and more schools are coming to value maker education and exploring ways to create makerspaces in their schools. Many schools are discussing how they might utilize their library to facilitate this. As my school has increased our commitment to constructionist learning and maker education over the last few years, we have done so in close collaboration with our school library. 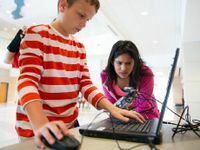 In exploring the relationship between the school library and school makerspace, it's not difficult to see why conversations about the growth of makerspaces are often tied to the conversation about the future of libraries. Both makerspaces and libraries are constructivist learning spaces that share a number of common goals, while approaching them in different ways and through very different material resources. Makerspaces and libraries are sites of informal learning. In the constructivist sense, libraries facilitate constructing knowledge through access to information, while makerspaces facilitate constructing knowledge through the manipulation and creation of material objects (based on a theory associated with constructivism, known as constructionism). While formal learning can also happen in both spaces, as classes are brought in to work toward more prescribed learning objectives, most school libraries and makerspaces are equally as supportive of non-curricular, student-driven, independent explorations. Libraries and makerspaces are inherently interdisciplinary spaces. The library has space and material for learning about all academic disciplines. More importantly, the availability of materials spanning wide arrays of subject matter encourages constructing knowledge across and outside of disciplines. Makerspaces provide access to physical resources typically regarded as materials for crafting, engineering, design, robotics, or media. They encourage blending these specialties in the service of learning any academic or traditionally non-academic disciplines. Libraries and makerspaces provide equitable access to materials and resources. Libraries provide access many print, visual, and virtual information resources that would not be accessible to most students and faculty, even in today's highly connected world. Makerspaces provide access to tools and materials that would be too expensive or impractical for most students or teachers to have as individuals or in a classroom. However . . .
Makerspaces and libraries are more than just resource closets. Librarians and makerspace facilitators are themselves resources, providing structured programming such as workshops and classes, as well as customized one-on-one or full-class guidance, mentoring, and much more. On-demand access to material and human resources helps students learn in powerful ways, unconstrained by limitations of time, space, and topics of inquiry. Libraries and makerspaces serve the common goal of building community. Communities of interest and practice are brought together and maintained through the design of communal space to promote sociality and collaboration (while also providing spaces for individual work). Other programming, like workshops, hackathons, book groups, and clubs, are encouraged to take place or to form in these spaces. These communities serve as an audience of users and viewers for the artifacts of knowledge being created in both spaces, and can help to share these artifacts even more widely. We are not the only school that has tried to find the right connection between our makerspace and our library. As the push for makerspaces in schools continues to grow, school libraries and librarians are finding themselves in a variety of different positions about makerspaces. Some librarians, seeing the close connections between the missions of both spaces, are leading the charge in their school communities for the creation of a makerspace as a component of the school library. With the similarities outlined above, it's not difficult to see why co-locating library and makerspace might be desirable, particularly considering budget constraints and a lack of available spaces in many schools. On the other hand, I've heard stories of educators advocating for the wholesale conversion of the library into a makerspace. It's important to see that neither of these spaces can replace the other. Librarians and maker advocates alike should be able to understand the need for both spaces and their different means for building knowledge, while recognizing and valuing the similar approaches to learning encouraged by each. A balanced understanding of the many ways that informal constructivist learning can take place supports a nuanced view, one that recognizes the learning potential in developing a school makerspace, while still valuing the role of the traditional library in a school or community. Finding the right relationship between the school library and school makerspace is something that each school must determine based on its own needs, resources, ideologies, and community. Understanding that both libraries and makerspaces are interdisciplinary sites of informal learning, contain physical and human resources to aid in constructing knowledge, and are spaces that build community can be great place to start. Has your school combined or overlapped its library and makerspace? Is it something that's under consideration? Please share your ideas and experiences below in the comments section.